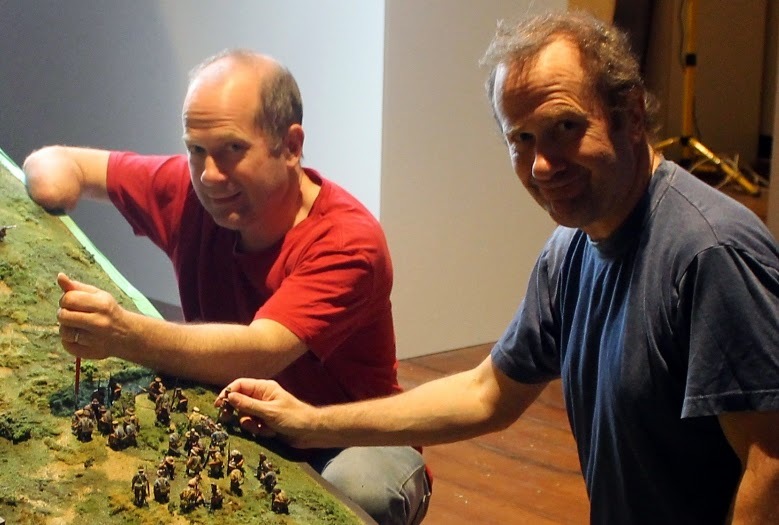 I was lucky enough to be present today when Michael and Alan Perry ceremoniously inserted the final 54mm figure into the massive Chunuk Bair diorama. This was the first time I'd visited the diorama since I last saw it a week ago without any figures. Although I knew roughly what to expect when I entered the New Zealand Room, I was still blown away at the sight of thousands of figures battling over the ten-metre long ridgeline. Being able to see the various formations of hundreds of figures, often with a bloody trail of casualties, brings the whole battle to life in a way that books, photos and even movies can't do. I'd love to show you some photos of the diorama, but I can't publish these until after the New Zealand Room opens on Anzac Day. But suffice to say that not only will this diorama take your breath away by its grandeur and scale, but you'll take an emotional hit too.